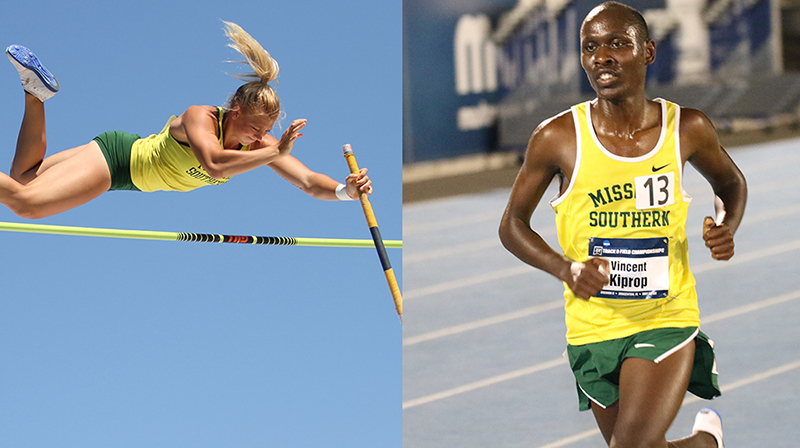 Bradenton, Fla. – Both Vincent Kiprop and Emily Presley picked up National Championships and the Lions men finished sixth overall as the Missouri Southern men’s and women’s track and field teams finished up the 2017 NCAA Division II Outdoor Track and Field Championships today. The day started with Daniel Hernandez picking up All-American honors in the javelin as he placed third in the event. Hernandez hit a mark of 220-02 in his first attempt and that was good enough to qualify for finals. He then hit a mark of 224-02 in his fifth attempt that put him in third place and on the medal stand. Derek Webb placed 13th in the event with a distance of 202-09. Presley then picked up her second-straight National Championship in the pole vault as she hit a height of 13-02.50 to take the title. Presley cleared her opening height of 12-10.75 and her second height of 13-02.50 without a miss, but failed to clear 13-06.50. She won the title on fewer misses and repeated her 2016 championship. Bryan Burns picked up his second All-American performance of the meet as he placed fifth in the shot put with a distance of 56-08.75. He hit that mark in his first attempt and it held on for a spot on the medal stand. Allie Heckemeyer placed 18th in the triple jump with a distance of 39-09.75. Kiprop finished off the night with his second National Championship of the meet, this one coming in the 5k. Kiprop took control of the race with two laps to go and cruised to a new meet, facility and MSSU school record time of 13:48.88. It is Kiprop’s fifth National Championship overall and fourth this year. The Southern men finished sixth overall, just three points behind fifth-place Central Missouri. It is ties the highest-ever finish in the outdoor championships for the men and is the second-most points (33) ever scored by a Missouri Southern men’s team. The Southern women finished 25th with 11 points. In total, the Lions had seven All-American performances at the National Championships and three National Champions. The performances are listed below.